Government has introduced a new section 80CCF under the Income Tax Act, 1961 (“Income Tax Act”) addition benefit to tax payer by making subscription to long-term infrastructure bonds. 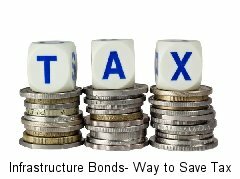 These long term infrastructure bonds offer an additional window of tax deduction of investments up to Rs. 20,000 over and above Rs/- 1 lakh deduction available under sections 80C. The Indian economy is on a robust growth trajectory and the best way to be a part of India’s growth story is to invest in its lifeline – its infrastructure retailer can participate by investing in this type of Infrastructure Bonds. Up to 5,00,000 (for very senior citizen of 80 years or above)= 0. If we do analysis for people in the Rs 1.8-5 lakh taxable income group, income will be taxed at the rate of 10%. Actual tax-saving: 10% of Rs 20,000 = Rs 2,000 (if you invest Rs 20,000 in the instrument you get to reduce your taxable income by Rs 20,000 thus giving a 10 per cent benefit). Most of companies offer this bond with Lock in period of 5 year and interest payment annually or cumulative at end of maturity. Rs 20,000 would fetch income of Rs/- 1800 every year for lock in period 5 years (till bond matures) hence total gain will be 9000 Rs/ – so effective return will be Rs 11,000 (Rs. 9000 + Rs 2000) on investment. At maturity one will receive principal amount Rs. 20,000 back as interest is already paid yearly. If someone decide that not to purchase this bond and invest this amount Rs.20,000 in other equity related instrument available in market either direct equity or mutual funds considering effective return 12% on investment (This is just assumption actual return may vary based on selection of actual investment option) than this investment Rs.20,000 – Rs.2000 (As you will pay Tax) would fetch an effective return of Rs 31,722 (Rs 20,000 + Rs 13772) Rs 18,000 invested @12% per annum for 5 years. Consider that Inflation is growing @ 8% rate than minimum amount required to beat inflation for Rs.20,000 would be Rs.29,387 at end of 5 year. Thus we see that for a person in the Rs 1.6-5 lakh slab, the benefit from investing in an infrastructure bond as a tax-saving instrument will be only Rs 1373 (Rs 30,760 – Rs 29,387) if one do not invest in this bond and pays tax and investing the balance in equity class instrument saving may be Rs 2,335 (Rs.31722 – Rs.29,387). In order to make your task easy we have calculated return on investment for Infrastructure bond with considering various scenarios table shown below will provide you exact idea wheatear to make investment in infrastructure bond or not. It is but obvious from above example that people who are in slab of 20% or 30% it is sensible to invest in to use the infrastructure bonds as a tax-saving instrument for the people in 10 % slab (Rs 1.8-5 lakh bracket), we would say no for investment in Infrastructure bond for Tax saving purpose.